The comments on YouTube are telling. Here is a quick interview with Tucker Carlson and Brandon Straka. Listen very closely to what Brandon Straka had to say about CNN, MSNBC, and the MSM about how they hide the truth about Trump and make it into lies. If the liberals and Democrats only get this out of this guy's #walkaway campaign it will shake up the Democrat's core. Video won't play. Loads fine, but oddly, google claims I have a problem? Oh, I have a problem alright, it's called cowardly libs censoring Conservative Speech! Great, the republican party is the best place for orientals and china persons. I agree to some degree Now republican. Asian and Oriental work ethic and intelligence make them a perfect fit to be a conservative. I don't know so much about an establishment republican. The #WalkAway campaign began on Facebook after a handsome, gay hairdresser from New York named Brandon Straka posted a video last month explaining why he was walking away from the Democrat party. People are leaving the Democrat party in droves because all they have to offer is violence, intolerance, divisiveness and hatred. Brandon Straka’s videos are so popular that he is beginning to get recognized in public. On Thursday, Brandon Straka went into a camera shop to purchase some new supplies when he was abused by leftists working there; they recognized him and refused him service. This thing is really catching on. But the DNC should not worry. They have Tom Perez, The most inviting sort of person in politics. Tom will get people to come back to the party just like he has convinced people to donate to the party. I posted #walkaway in a post to another guy about this new leftwing movement and a couple of libs asked me what it was. I said I wasn't sure, I got it from another lib who said he was checking it out. Cheeky boy! It's not nice to mess with those that still wear sneakers with velcro straps. Cheeky boy! It's not nice to mess with the mentally challenged. It isn't? Well Hell, there goes my greatest pastime. Nah, I'll never give up that, or cigars and coffee. It's addictive. We all need hobbies. You troll liberals and they lose elections and call people Nazis whilst wearing skinny jeans. If you get bored, read this thread in the Discuss section at the end of the article where I'm debating this lib, DougStamate, the guy claims to be 68, I think he's more like 8. Tom Perez is working to be just as effective for the GOP as Pelosi and Waters. 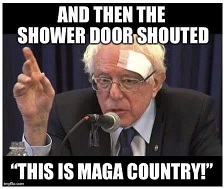 Just yesterday he said the socialist broad from NY was the future of the democrat party. I hope so.